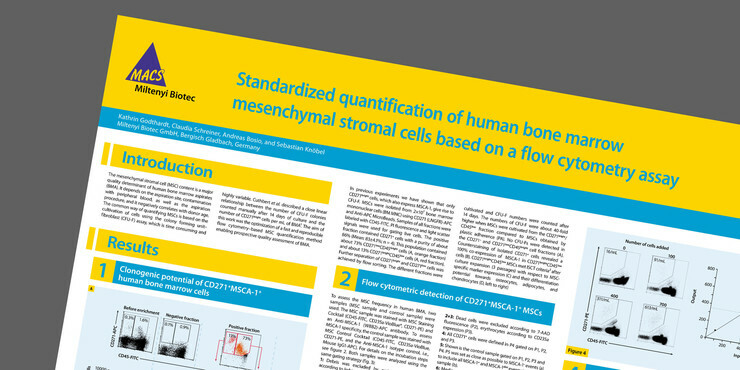 The success of bone marrow (BM)-derived mesenchymal stem cell (MSC) experiments depends on the quality of bone marrow aspirate (BMA), as well as the number of MSCs in the BMA sample. Commonly, MSC quantification is performed by CFU-F (colony-forming unit fibroblast) assay, which are time consuming and highly variable. Based on the finding that the number of CFU-F colonies generated after 14 days of BM MNC (bone marrow mononuclear cell) culture is linearly related to the number of CD271bright cells in BMA1, we’ve developed a reliable procedure for absolute quantification of MSCs in BMA. 1. Cuthbert, R. et al. (2012) Cytotherapy 14: 431–440.